Users are allowed and even encouraged to submit specific feedback about quizzes. Please keep in mind that some of these comments may spoil individual quiz questions. Looking for the quiz that goes along with these comments? Comments are the sole responsibility of the person posting them. defamatory, obscene, abusive, threatening or an invasion of privacy. You must be logged in to post or rate comments. For reference, click here reveal the answers for this quiz. view the answers, and then take the quiz. But nobody likes a cheater. 1. "First Time Again": At the quarry, what falls and starts the freeing of the walkers, forcing Rick's group to begin their plan a day early? 3. "First Time Again": Which of the following is not at the quarry? 7. "JSS": Who fires on the oncoming truck, killing the driver and as a result sounding the horn? 9. "Thank You": This is overheard as the Alexandrians fled back to town: Thing is, they all aren't gonna make it. You try to save them. You try. But if they can't keep up, you keep going. You have to. You make sure you get back. Who is speaking? 20. "Always Accountable": What is in the bag that Daryl takes from Tina and Honey? 23. 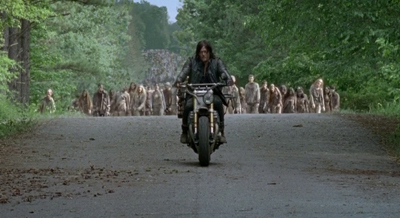 "Heads Up": When Rick talks to Morgan about letting the Wolves go, which other two people are present? 25. "Start to Finish": Who speaks of Alexandria being worth a price, for which the residents might not have yet paid a sufficient price?